Mobile App Prodigies: Kids Develop the Darndest Things! We already know that our phones are amazing communication, entertainment and even productivity tools. But can’t we set our sights higher — maybe use them for a common good, as well? Teenager Alison Bick did just that when she conceived a way to use a mobile device to test water quality. The Short Hills, NJ, native wrote an app that enables the phone to analyze water samples using its camera, creating a low-cost, portable method of detecting E. Coli and other bacteria. What’s most stunning is that this approach produces the same results as traditional water tests, at a 99% confidence level. 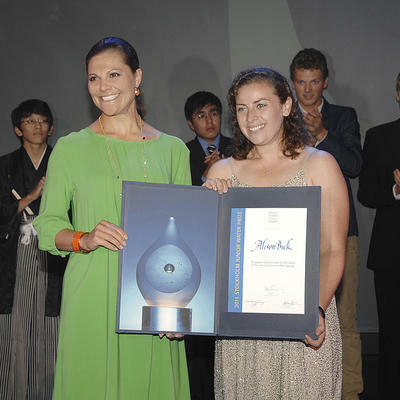 This impressive concept nabbed the International 2011 Stockholm Junior Water Prize, an award that Bick finally achieved after four years of trying. The honor was bestowed on her by H.R.H. Crown Princess Victoria of Sweden at a ceremony during Stockholm’s World Water Week. Not only is it great to see new ways that mankind can benefit from mobile technology, but Alison’s achievement also did something else here: It gave us an argument for anyone who says that kids are just lazy, self-involved and waste too much time on gadgets, or that chicks can’t rock the tech or science. Bick’s achievement sufficiently drops the hammer on four different stereotypes. Way to go, girl. Of course, Bick’s not the only talented kid out there, and she’s not even the youngest. Top honors in Iconosys’ recent “Pitch That App!! 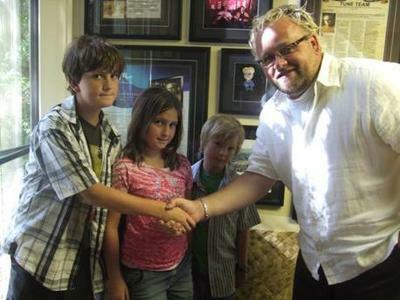 !” contest wound up going to three elementary school kids from Mission Viejo, CA. The Deubler siblings — Daniel, 12, Whitney, 9, and Nicolas, 7 — went up against grown-up competitors to present at an evening “pitch slam” event. Their idea, to create a virtual dog-dressing app that lets users design and order goods in real life, beat out nearly 200 entries to win a contract offer to develop and market their app. Inspired by a friend who had an aggressive form of Muscular Dystrophy called Duchenne, the children plan to donate half the profits from the app to a related research organization. Iconsys is planning its next “Pitch That App!! !” contest event for the evening of September 22 in Laguna Hills, CA, so if you’re interested, you can hit this link here. And you don’t have to be a kid to enter. Got a brilliant idea of your own for a phone or tablet? What’s your opinion on a clever or useful app that’s still lacking in the market?